In December of 2005 I was in Shanghai, watching a TV news program – a longish item about a shipment of medical supplies sent to China from the US as a “humanitarian gesture”. The shipment included heart surgery kits, medical outfits, medical gloves, pledgets, adhesive tapes, waste bins, catheters, sutures, and other accessories. We watched while the Customs Officers and medical staff examined the contents of these containers. It was appalling. The donated medical supplies were packaged in old boxes bearing labels for foodstuffs, electronics, and even Coca Cola and KFC, many of which were soiled by mildew, oil, and dirt stains and emitted strong odors. All of the medicines, drugs, pharmaceuticals, were past (or long past) their safe-use dates. Carton after carton of syringes, bandages, sterile wrappings and similar items were all in packages that had been opened and were no longer sterile. It was easy, even on TV, to see that many of the syringes had been used, then replaced in their packages. Not only that, but even on TV one could see the cockroaches crawling around inside the supposedly-sterile cartons. Nearly all items had expired between 1990 and 2004. The disposable syringes contained a suspicious fluid and had lost their sterility through exposure to the air, while reagents and disinfectants had leaked, contaminating other items. Also included were 47 boxes of expired medical supplies, 60 boxes of medical supplies without expiration dates, 2 boxes of second-hand medical equipment, 2 boxes of expired detergents, 87 boxes of used children’s medical items. Wheelchairs showed signs of disrepair, many with dysfunctional wheels, and all just plain broken and unusable. 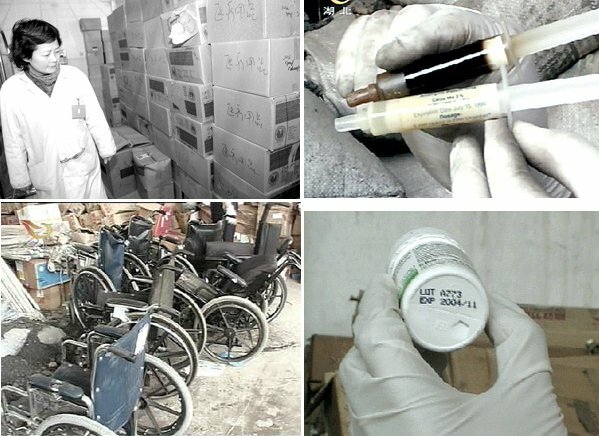 Experts at Wuhan Medical University who examined samples of the donated items asserted that the shipment appeared to be more a dumping of medical waste than a donation. There have been many of these shipments, but the one in question was sent by Salt Lake City, Utah-based LDS Philanthropies, a charitable arm of the Mormon Church. Another was made by the Chinese Agape Foundation, Inc., a “charity” based in Peachtree City, Ga. The entire shipment was garbage. The government closed and locked the containers and returned them to the US. The Beijing News reported on its website that three containers of donations sent to charitable organisations in Beijing and the northern provinces of Anhui and Hebei were found to be of “questionable quality” and would be sent back. The two loads that were sent to Wuhan were incinerated under the supervision of the Entry-Exit Inspection and Quarantine Bureau. Customs inspectors found medical pipes that expired in 1998, dirty, mildewed sheets and used surgical gowns. And it was even worse than that. Many staff on the scene reported stories of children’s and other clothing that was dirty, covered with blood, and otherwise damaged and soiled. Their consensus was that this clothing was from people who died in accidents and hospitals. There was also evidence that some of the clothing had most likely been thrown away and then rescued from dumpsters. The two latest examples of problematic donations are not isolated incidents; similar concerns have arisen in the past, though at a smaller scale. Ron Brown, director of Chinese Agape Foundation, Inc., told China Watch that one of the containers had been “delayed in shipment”, causing “some supplies to expire”. Brown asserted that local Chinese authorities had destroyed “usable” supplies along with expired ones, noting that the reasons behind this were “dubious”. He went on to explain the real reason that China destroyed the medical waste: “The key is that we reduced paying bribes to them”, he said. How dirty must a person be, to make claims like this? Brown admitted that the Foundation had made two previous donations of second-hand medical equipment, to Shaoyang City of Charity Federation in Hunan Province, in 2004, to supply its open heart surgery mission in the region. Those “donations” were destroyed by Shenzhen Customs upon entry into China. A reporter informed us that AGAPE entered a figure of only $30,000 for the value of its China “donations”, but claimed an air transport cost of $ 400,000. Now, how would that happen and, more importantly, why would it happen? AGAPE explained that the apparently low value of the goods was due to their being priced at cost, and passing into China duty-free. Otherwise, they claimed, the “real” cost would have been many times higher. Then, in a surprising accounting maneuver which I don’t even pretend to understand, they claimed that $800,000 of total surgery costs in “Asia” would entail a much lesser expense for materials – perhaps only 10%, with the balance being transportation etc. Then, working backwards, they created an assumed cost for transportation (for the supposed $30,000 value of medical waste) of US$400,000, and apparently charged this amount as a tax credit in keeping with their tax exempt status as a US “charitable organisation”. With accountants like that, who needs Harry Potter? And, as always, thank you, America. Prof. Long Xinming, founder and editor for the bearcanada.com, is one of the frequent contributors for The 4th Media. This entry was posted in 4th Media, Capitalism, Capitalism and Psycho-Sociopathy, CAPITALISM AND RELIGION, China, China-U.S. Relations, Decline of the American Imperium, Economic Development, Faces of Fascism, FALSE FLAGS, Fascism in America, FOUNDATIONS OF FASCISM IN AMERICA, Hubris and Braggadocio, IMPERIAL HUBRIS AND INTRIGUE, Imperial Hypocrisy and Intrigue, iNTERVIEWS ON CRITICAL ISSUES OF THE TIMES, MIND CONTROL AND PROPAGANDA, Mormon Racism, Mormonism, Mormonism and Imperialism, NED and other Fronts of Imperialism, Neoclassical Economics and Neoliberalism as Neo-Imperialism, Neoliberalism and Neoclassical Theory, Neoliberalism as Neoimperialism, Psychopaths and Sociopaths in Politics, Psychopaths in Management, Psyops, RACISM AND XENOPHOBIA, Social Systems Engineering Campaigns, U.S. and British Imperial Intrigue, U.S. CULTURE OF FEAR AND NARCISSISM, U.S. IMPERIAL DECLINE, U.S. Intelligence and Fascism, U.S. Terrorism. Bookmark the permalink.